The Arctic sea ice extent changes throughout the year. The minimum sea ice extent is normally around September of each year. The ice extent grows again till February/March when it reaches its maximum extent and subsequently again the sea ice extent starts to decrease till September. This cycle repeats each year. 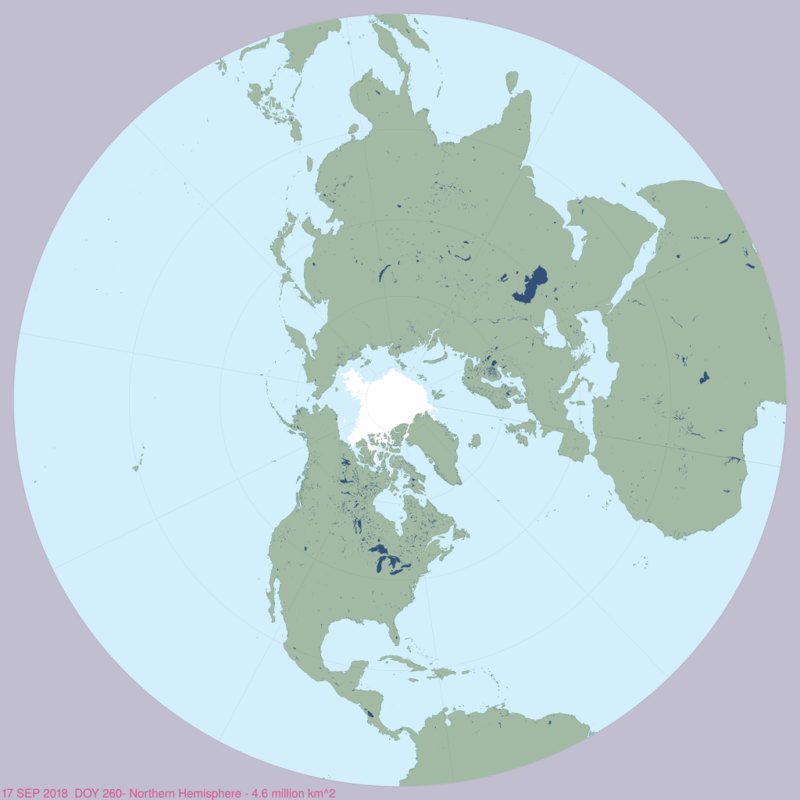 This post has three images of Arctic sea ice extent for different dates to illustrate the changes in ice extent. Image source NSIDC. The Ice extent on 17-01-2019 was 14.2 million sq. km. The change over 10 years for the same date of the year 17-01-2019 is not very significant and the Ice extent was 13.8 million sq. km. and can be attributed to natural variations. The third image of 17-09-2018 is just four months back when the ice extent was at yearly minimum at 4.6 million sq. km. compared to 13.8 million sq. km. on 17-01-2019. This would mean that within a span of four months the ice extent has grown three times. Nothing surprising about this and this is also natural phenomenon which happens every year. દર વર્ષે દરરોજ આર્ટિક આઇસ ના વિસ્તાર માં વધ ઘટ થતી હોય છે. આ વિસ્તાર સામાન્ય રીતે સપ્ટેમ્બર મહીના માં નીચા સ્તરે પહોંચે અને ફરી વધવાનું ચાલુ થાય. મહત્તમ વિસ્તાર ફેબ્રુઆરી/માર્ચ મહિના માં થઇ જાય. 17-09-2018 બરફ નો વિસ્તાર ફક્ત 4.6 મિલિયન ચો. કિ.મી. હતો જે 4 મહિનામાં કુદરતી ત્રણ ગણો થઇ ગયો. કઈ નવું નથી. 17-01-2019 બરફ નો વિસ્તાર 13.8 મિલિયન ચો. કિ.મી. છે. Arctic Sea Ice Extent on 17th September 2018 is 4.6 Million Sq. Km. Arctic Sea Ice Extent on 17th January 2019 is 13.8 Million Sq. Km. 10 વર્ષ માં શું ફરક પડ્યો ? 17-01-2009 બરફ નો વિસ્તાર 14.2 મિલિયન ચો. કિ.મી. હતો. તેની સામે 17-01-2019 બરફ નો વિસ્તાર 13.8 મિલિયન ચો. કિ.મી. છે, જે કોઈ અસાધારણ ફેર ફાર ના કહેવાય. Arctic Sea Ice Extent on 17th January 2009 is 14.2 Million Sq. Km. Weak La Nina Exists Till The End Of April 2018. 2018 એપ્રિલ આખર સુધી સામાન્ય લા નિના હજુ અસ્તિત્વ માં છે. Last five ONI Index are OND 2017 -0.9ºC, NDJ 2018 -1.0ºC, DJF 2018 -0.9ºC, JFM 2018 -0.8ºC and FMA 2018 -0.6ºC. 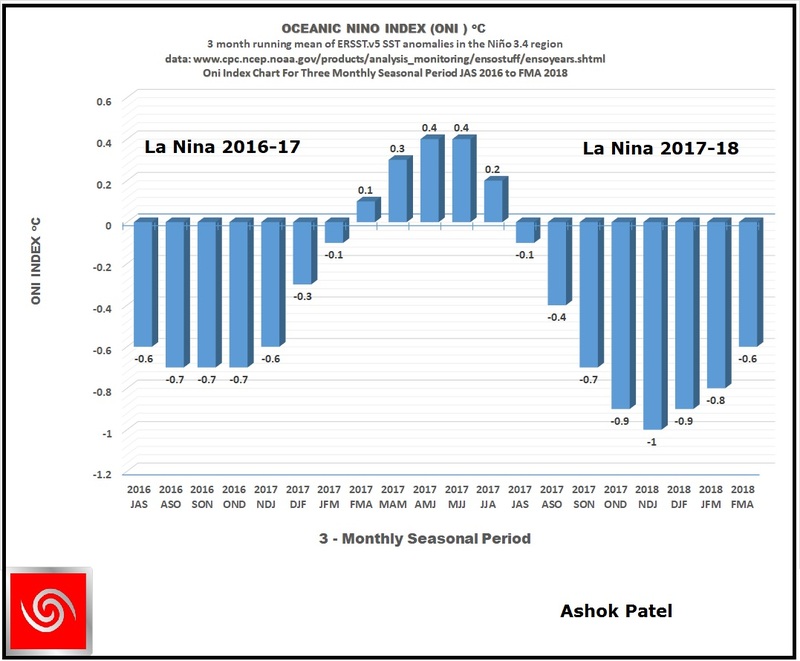 La Nina event was already in existence and since the latest 3-monthly seasonal ONI Index is less than or equal to -0.5ºC it fulfills the NOAA criteria for continuance of La Nina at the end of April 2018. La Nina event 2017-18 has officially evolved at the end of March 2018 (JFM 2018). 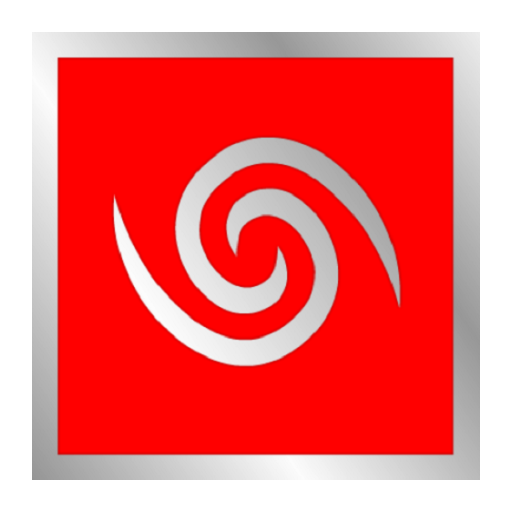 This La Nina event is the second consecutive La Nina event, the other being 2016-17 La Nina event that ended at the end of January 2017 (NDJ 2017). 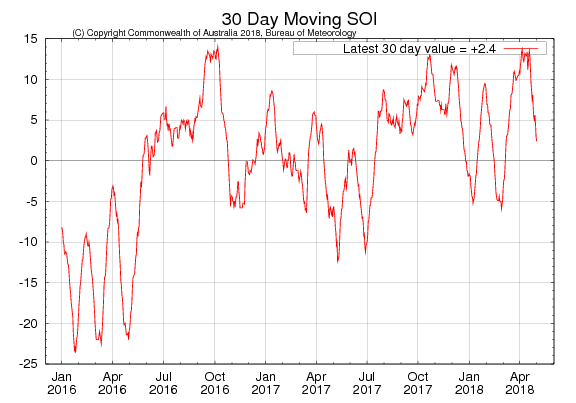 The 30-day Southern Oscillation Index (SOI) to 2nd May 2018 was +2.4, while the 90-day SOI remains within the neutral range. 30 Days average SOI was +4.02 at the end of April 2018 and was +0.85 on 4th May 2018 as per The Long Paddock – Queensland Government and 90 Days average SOI was +2.55. SOI Monthly graph up to April 2018 as per The Long Paddock – Queensland Government. Equatorial sea surface temperatures (SSTs) are near-to-below average across the east-central and eastern Pacific Ocean. La Niña is expected to transition to ENSO-neutral during the April-May, with ENSO-neutral then likely (greater than 50% chance) to continue through the Northern Hemisphere summer 2018. All eight of the surveyed international climate models indicate equatorial Pacific sea surface temperatures are likely to rise further over the coming months. 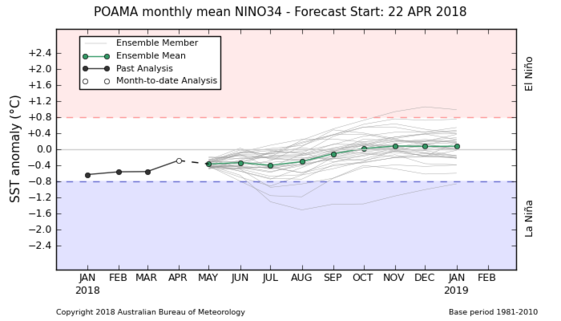 A neutral ENSO state is the most likely outcome for the remainder of the southern hemisphere autumn and winter. Two models indicate central Pacific sea surface temperatures may approach El Niño threshold values during spring, however model outlooks produced during or spanning autumn have a lower accuracy than at other times of the year, and should be viewed with some caution. Last five ONI Index are OND 2017 -0.9ºC, NDJ 2018 -1.0ºC, DJF 2018 -0.9ºC, JFM 2018 -0.8ºC and FMA 2018 -0.6ºC. Since, the last consecutive 3-monthly seasonal ONI Index are less than or equal to -0.5ºC it fulfills the NOAA criteria for continuation of a weak La Nina at the end of April 2018. La Nina event 2017-18 has officially evolved at the end of March 2018 (JFM 2018) and yet is in existence at the end of April 2018. This La Nina event is the second consecutive La Nina, the other being 2016-17 La Nina event that ended at the end of January 2017 (NDJ 2017). Theoretically a Full Fledged El Nino event is not possible to be established during the Indian Summer Monsoon, since there are only five 3-monthly seasons left till end of September 2018, namely MAM 2018, AMJ 2018, MJJ 2018, JJA 2018 & JAS 2018, and Indian Summer Monsoon normally comes to an end by then (September end). NOAA માપદંડ મુજબ 2018 એપ્રિલ આખર ના સામાન્ય ‘લા નિના’ હજુ અસ્તિત્વ માં છે. છેલ્લા પાંચ ત્રી-માસિક સીઝન નું ONI ઈન્ડેક્સ OND 2017 at -0.9°C, NDJ 2018 at -1.0°C, DJF 2018 at -0.9°C, JFM 2018 at -0.8°C, and FMA 2018 at -0.6°C. છેલ્લું ત્રી-માસિક સીઝન નું ONI ઈન્ડેક્સ -0.5°C અથવા તેનાથી નીચે રહેલ છે. એટલે NOAA માપદંડ મુજબ 2018 એપ્રિલ આખર ના સામાન્ય ‘લા નિના’ હજુ અસ્તિત્વ માં છે. સૈદ્ધાંતિક રીતે ભારતીય ચોમાસા દરમિયાન NOAA ના માપદંડ મુજબ વિધિવત ‘એલ નિનો’ થવાની શક્યતા નથી કારણ કે ભારત નું ચોમાસુ સપ્ટેમ્બર આખરે પૂરું થતું હોય છે અને હવે સપ્ટેમ્બર આખર સુધી ફક્ત પાંચ ત્રી-માસિક સીઝન બાકી છે, જે છે MAM 2018, AMJ 2018, MJJ 2018, JJA 2018 & JAS 2018.